There are quite a few things Android Wear smartwatches are designed to do. They count your steps as you walk or exercise, they give you the weather forecast when you need it, they deliver notifications and Google Now cards from your smartphone straight to your wrist, they even tell time! Can an Android Wear smartwatch play games, however? Sure it can! Android Wear smartwatches pack powerful processors, sufficient amounts of storage, and enough RAM to handle some light gaming. Although we're pretty sure that gaming was one of Android Wear engineers' last priorities. So yeah, here we are, presenting you with our list of the best Android Wear games we came across. Just don't set your expectations high as these have rather simple gameplay and graphics, which is understandable given the hardware they're intended to run on. Still, if you have a few minutes to waste, and you don't feel like taking out your smartphone, these smartwatch games for Android Wear should do the trick. Check them out! We'll start this list with a clone of the popular puzzle game 2048. The goal, in case you've never played this one, is to put two and two together, and we mean that quite literally. Squares of the same number double in value when combined, yet new squares appear in their place. Eventually, you either reach the elusive 2048 figure, or get stuck with an overcrowded board. The concept behind Swip3 is pretty similar, but instead of numbers you have colors and instead of combining them you have to match three in a row or column. The game has integrated leaderboards so you can see how your highscore compares to those of your buddies and other players. Remember Wild Gunman on the NES? Well, this game is kind of simple – outlaws show up on the saloon's windows and you have to snipe them down before they fire at you. Just be careful not to shoot any of the friendly ladies that appear as well. TetroCrate is a Tetris-inspired puzzle game – you drop pieces of various shapes across a board, then each complete row gets cleared, freeing space for more pieces to be placed. And here's a puzzle RPG game. Tales of Pocoro employs a cute, retro style to bring instant entertainment to your wrist. You'll get to clear over 200 levels across 3 levels of difficulty, and you'll be unlocking new characters as you play. The game works on both round and square displays. In You Sunk, you're behind the guns of a battle ship, and your goal is to destroy all enemies, all while avoiding enemy fire. There are friendly ships as well which you have to protect. This one's ideal for those times when you have just a minute or two to kill. In a nutshell, a bunch of balls of various colors bounce around the screen, and your goal is to guide them to their corresponding half of the screen. What makes BiDot challenging is that you have to guide multiple balls simultaneously. Yup, it's poker, only smaller. You place your bet, you draw cards, and win or lose, depending on how strong your hand is. You can't play against actual opponents, however. And why not add this cute tower defense game to the list? Your hero acts as your tower, slaying incoming hordes of enemies with his or her weapons and special skills. By monitoring your activity with your wearable's sensors, the game adds in-game bonuses for the steps that you take. 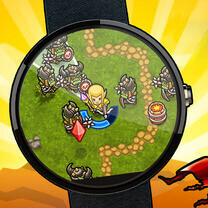 We bring your attention to this old-school role-playing game for your Android Wear device. Develop your characters, buy weapons, develop magic skills, and complete quests as you crawl through a treacherous labyrinth. Do note that the game is in alpha stage of its development, so it may be a tad glitchy at this point. How hard is your... droid? In this game, you control a falling robot as it falls down a shaft with obstacles in the way. Collect points and power-ups as you go to reach a high score! Think your visual memory is in top shape? Test it with this quick and easy memorizing game. Your goal in Memory Feud is to construct a given 3-, 4-, or 5-letter word by picking letters one by one. The challenge lies in that you have to memorize the position of the letters before constructing the word. This game is kind of like Swing Copters – you're in charge of a tricky-to-control rocket and you avoid obstacles as you fly through space. It is a fun, yet a bit frustrating time waster. Another simple game the kind of which you've surely played before. Tap on pumpkins of the same color to clear them – the more pumpkins you clear, the more point you get for the move. And finally, a memorizing game similar to Simon Says. The goal is to remember the animals escaping the zoo in the correct order. lol apple cant do that since you can only see it for 10 seconds. Future of gaming is VR, not on a one inch diameter display.... then again, the article did say "time wasters".